What do you get when women, homemade mallets, beat-up bicycles and a ball collide? 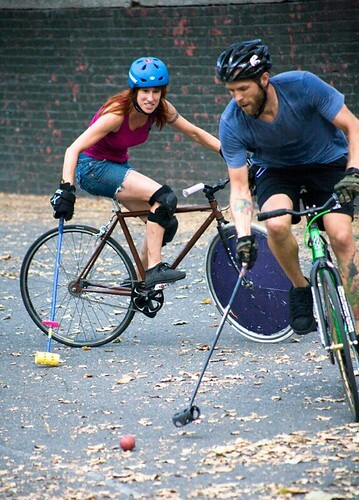 Bike polo, of course! Closer to street hockey than pony polo, the game is played three-on-three until one team nets five goals. The hardcourt sport has been growing in popularity since its inception in the 1800s. There’s been a serious spike in the past 10 years, with teams popping up all over the world. One might say it is the fastest-growing polo variety, with canoe, camel and yak polo lagging behind. You’ll have to follow the link to see the 16 photos that made it into the story. and the Question and Answer with Chandel, Fiona, Sara and Katie. They talk about who they have dated. This entry was posted by Doug D on July 21, 2010 at 11:29 pm, and is filled under Bike Polo, Media/Press, New York. Follow any responses to this post through RSS 2.0. You can leave a response or trackback from your own site. Great that they are putting a spotlight on the ladies. Frustrating that they ask about falling in love on the court. They wouldn’t have asked who the guys had dated.